Miners are at risk of developing lung diseases called pneumoconioses because of their regular exposure to airborne dust, and miners with five or more years' mining experience who are exposed to exhaust from diesel engines have an increased risk of dying from lung cancer. Pneumoconioses (meaning dusty lung) can cause impairment, disability and premature death. Medical treatment is not effective in advanced cases of these diseases, so preventing them – through controlling respirable dust exposure – is essential. The two main types of pneumoconiosis that affect miners are coal workers’ pneumoconiosis (CWP), commonly called black lung, and silicosis. CWP is associated with coal mining, but silicosis can affect workers in many types of mines and quarries, including coal mines. Exhaust from diesel engines has the potential to produce symptoms typical of asthma, and diesel exhaust exposure may contribute to other respiratory symptoms such as irritation of the nose, inflammatory changes in airways, and lung function decline. Other respiratory diseases, such as chronic obstructive pulmonary disease (COPD), may also occur in miners separately from, or in addition to pneumoconiosis. NIOSH, through the Coal Workers’ Health Surveillance Program (CWHSP), provides underground coal miners with an opportunity to have chest x-rays on a periodic basis throughout their careers. The Respiratory Health Division of NIOSH manages this program and has compiled data since 1970 to track the prevalence of CWP in coal miners. 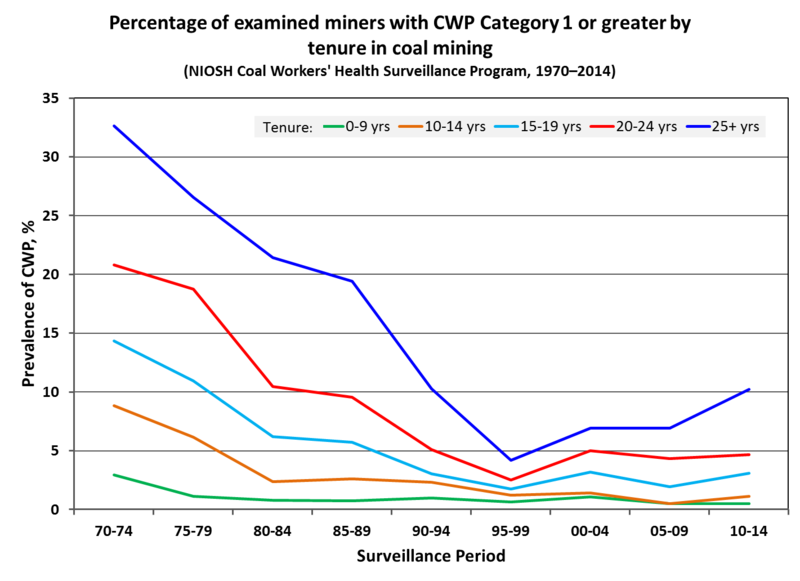 As shown in the attached figure, the prevalence of examined miners with 25 or more years of mining experience that were diagnosed with CWP dropped from approximately 33% in the early 1970s to less than 5% by the late 1990s. However, since that time, CWP prevalence has increased to over 10% for the longest tenured miners. NIOSH also recently reported an unprecedented number of miners (416) were diagnosed with progressive massive fibrosis (PMF), which is the most severe form of CWP, when examined at three black lung clinics in Virginia. Through a special CWHSP program, NIOSH also examined over 2,200 surface miners from 2010-2011 and found 46 with CWP, 12 of which had PMF. From 2007 through 2016, CWP has been the underlying or contributing cause of death for 4,118 miners and a total of 75,178 miners from 1970 through 2016. Over $46.685 billion dollars in federal compensation have been paid to miners and their families from 1971 through 2017 for claims filed under the Black Lung Benefits Act. Silicosis is not tracked as regularly or thoroughly as CWP but available historic data from the 1990s shows that over 23% of reported silicosis deaths were attributed to mining. Also, the change in disease profile for miners diagnosed with pneumoconiosis suggests that US coal miners are being exposed to more crystalline silica than in the past. The Diesel Exhaust in Miners Study of more than 12,000 miners showed a significant increased risk of dying from lung cancer among miners who had ever worked underground. This risk increased as the miners’ exposure to respirable elemental carbon – representing diesel exhaust – increased. Reducing miners’ exposure to respirable airborne contaminants directly reduces the risk of developing lung disease. Therefore, NIOSH Mining conducts research to identify sources of elevated respirable dust and diesel exposure and then identifies and evaluates engineering controls that can successfully reduce emissions from these sources. Control technologies and operating practices that can prevent airborne contaminants from reaching the breathing zones of workers are also researched. Another research goal is to develop sampling instrumentation that can provide mine worker and operators exposure information during or immediately after the working shift. NIOSH Mining has published resources for the mining industry to assist their effort to control dust and diesel exposure. These include Best Practices for Dust Control in Coal Mining, Best Practices for Dust Control in Metal/Nonmetal Mining, Dust Control Handbook for Industrial Minerals Mining and Processing, and Diesel Aerosols and Gases in Underground Mines: Guide to Exposure Assessment and Control. NIOSH research produced a continuous personal dust monitor that can provide an accurate measurement of airborne respirable dust at the end of a mine workers’ work shift, and provides on-shift information that the worker can use to reduce his or her exposure. This instrument was approved for use as a coal mine dust personal sampler. Recent MSHA rulemaking specifies this instrument be used to measure dust exposure in underground coal mining operations. NIOSH has also developed a mobile video exposure monitoring method and software application (EVADE) that combines real-time exposure data with concurrently recorded point-of-view video to identify exposure sources for mobile workers. NIOSH researchers identified factors affecting the protection from airborne dust by enclosed equipment operator cabs and published a method to quantify air leakage into cabs. An instrument to monitor personal exposure to diesel exhaust particulate has been developed and demonstrated by NIOSH researchers. This instrument is commercially available.